I’ve been watching Eagles nest for the past few years and there ought to be a warning before you start watching them because it is addictive, you want to see everything that happens in that nest! It is amazing to watch them as they build their nest and then the eggs appear I have never seen more than two eggs in the nest. A couple of years ago I kept watch and the eggs never hatched, the great birds finally left the nest, which to me was a very sad sight. As soon as the young eaglets break open the shell they come out with their mouths wide open, squawking to be fed. Parenthetical statement, both of my children nursed before the umbilical cord was cut so I think all babies are born hungry! The parents take turns sitting on the nest and bringing the food. Sometimes it is a sight you would rather not see if you have a weak stomach and it is hard to watch as they use their mighty beaks and claws to rip apart small animals for their babies. 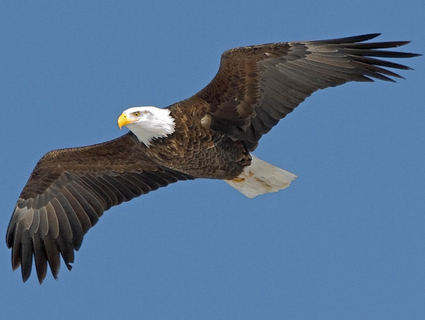 The eagle has a long life span there is one in captivity that has lived for 48 years. One thing I envy about the eagle is it’s unique ability to renew itself. As the eagle ages, gets sick or is wounded, it will fly to the highest place it can find and there will begin the process of plucking out all of its feathers, no easy task as there are seven thousand of them and he ends up a bloody mess. He then beats his beak against a rock to trim it, and his talons get the same treatment. After he has finished he stays in the sun and begins the process of being renewed. When the feathers grow back and the beak and talons, which are made of keratin just as our own hair and nails, grow back, he is again the mighty hunter that he was in his youth. Psalm 103:5 Who satisfies your mouth with good things, So that your youth is renewed like the eagles. The Bald Eagle is our nation’s symbol of strength and valor and as the eagle goes through a process of healing and renewing, I feel it is time for our country to take a lesson and do the same. We accomplish that by remaining the Christian nation that our fore fathers came to this land to build! 2 Chronicles 7:14 if My people who are called by My name will humble themselves, and pray and seek My face, and turn from their wicked ways, then I will hear from heaven, and will forgive their sin and heal their land. We must stand strong in the unity of prayer if we are to keep the blessings of God on this nation. On a personal level, the eagle teaches us that we are never too old to start over. Isaiah 40:31 But they that wait upon the LORD shall renew their strength; they shall mount up with wings as eagles; they shall run, and not be weary; and they shall walk, and not faint. That is a promise to us, we can be renewed, and we can not only walk, but also run and not be weary! If the eagle looked at himself in the mirror as he was resting on the rock, stripped of his feathers and waiting for them to return, he might be discouraged at his image and decide to never try to fly again, let alone try to hunt. So what’s going on with you? Are you tired, discouraged, stripped of your glory? Hebrews 12:1-2 Wherefore seeing we also are compassed about with so great a cloud of witnesses, let us lay aside every weight, and the sin which doth so easily beset us, and let us run with patience the race that is set before us, Looking unto Jesus the author and finisher of our faith; who for the joy that was set before him endured the cross, despising the shame, and is set down at the right hand of the throne of God. The saints that have gone before you are rooting you on and want you to succeed! If you feel like you have been stripped of your zest for living, your confidence, and your desire to carry on, just shed your skin, give everything to God and then rest in the “Sun” while you are healing and you will be renewed! Next Post I just look like it! Nice thought for the new year. I just finished reading a book by Dr. Chuck Missler, “The Magog Invasion”. He wrote this book in 1995 & when you consider all that has happened from then to now, one has to really consider how much time do we really have left. Lynne calls this one of those books you read & then go hide in a closet for awhile to calm yourself. I like the way you used the eagle to make your point. I think it is a time for all of those who are serious about their relationship with the Lord & future to renew them self. We need to be pure, clean without spot or wrinkle to stand before Him. We also need to be in a solid place so full of Him we can see those around us who need help to get there them self. So my desire is to renew myself in the Lord so people only see Him & not me. May we all grow in Him in the coming days, God bless.